I want to rank My blog. I want to put my website link High-Quality Quora answers. *You have to put the link using Anchor/Keyword text with the answers. seo. you can review my profile for my clients feedbacks on my work. i will create high quality pr9-pr7 da dofollow permanent homepage backlinks/web.2 backlinks/ forum profile/wiki/press realese. all links permanent and all links indexing and pinging. all links create different ip and different domain. please response me. i will give you previous work sample. thank you. i am seo and linkbuilding expert. 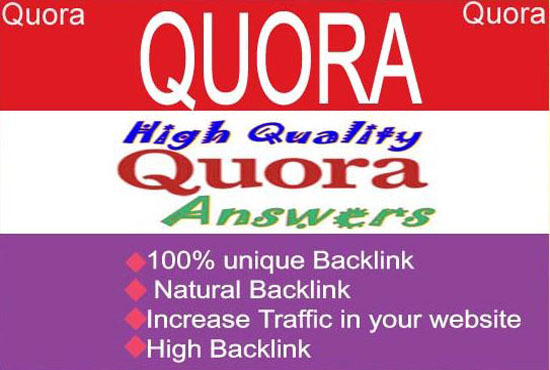 i will provide you high quality quora answer and backlinks. every answer will be clickable. i have great experience in this job. if you can hire me , i will create my all work are 100% manually . i am expert on quora answer with backlink.if you like me ,you can hire me.